The results of the 2014 elections have brought out many surprises. Apart from Narendra Modi-led BJP's landslide win and the crushing defeat of Congress, Mayawati's Bahujan Samaj Party (BSP) has also been decimated. As far as Muslim representation is concerned, just 22 Muslims have won in the election, which is be probably the lowest tally ever. In fact, for the first time since Independence,it seems that there will be no Muslim MP from Uttar Pradesh (UP) in the Lok Sabha. The state which has nearly 4 crore [40 million] Muslims has nearly 70 Muslims in the Assembly and routinely sent 6-8 members in the parliament. However, almost all the Muslim candidates of SP, BSP and Congress lost in the wave. The BJP is leading in nearly 70 constituencies in the State. Veteran leaders like Shafiqurrahman Barq are also trailing. The counting is still on and there may be a slight change but the trends clearly show that it will be a house with lesser Muslim MPs, probably, just 3.85% in the lower house of the parliament. 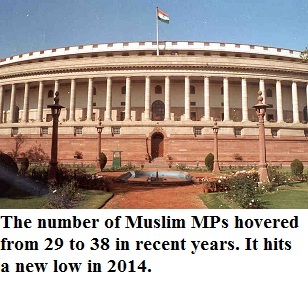 Generally, there have been 28 to 40 Muslims in Lok Sabha. Muslim candidates have from different parties including All India Trinamool Congress (AITC), CPM, Congress, RJD, NCP, LJP, AIMIM, AIUDF, PDP, IUML and AIADMK. No Muslim has won on BJP ticket. Also, none of JDU, NC or DMK's Muslim candidates could win. On the basis of trends, it can be safely said that seven Muslims may win from West Bengal, four from Bihar [including Tariq Anwar, Taslimuddin], two from Kerala [IUML], two from Assam, four from Jammu & Kashmir that include three PDP candidates and possibly one independent, one from AP, one from Tamil Nadu [AIADMK's Anwar Raja], Lakshadweep et al. The figure would be 20 or 21, once the final results are out. Asaduddin Owaisi is leading from Hyderabad on MIM ticket while Congress has done so badly that in Lakshadweep too the Congress candidate has lost to NCP's Muslim candidate. National Conference hasn't won a single seat in J&K. It shows the people's disenchantment with Omar Abdullah's government. Even Farooq Abdullah lost the election. From Ghulam Nabi Azad to Salman Khurshid and Mohammad Azharuddin, many prominent Congress 'leaders' were defeated. However, these are just statistics. Having more MPs, doesn't necessarily work at all for a community [see the links below]. Many of the Congress' Muslim MPs have been useless. In fact, so many of them never asked a single question in the Parliament during five years. It's better to have non-Muslim candidates who are just and speak for the problems of all people, rather, than MPs who won just because of the qualification that they were Muslim. 4. Should there be Muslim ministers in union cabinet?